Ordinary Goodness: Reflections on MFA, semester one. Reflections on MFA, semester one. Since I started in January, I've gotten a lot of questions about my low-residency MFA program in creative writing. How does it work? What books are you reading? What do you have to do, period? Do you have exams? Now that my first semester is over (yay! ), I thought I would explain it a bit and offer some reflections so far. I am getting my Masters at Goddard College, which has one of the oldest and best low-residency MFA programs in the country. (Thanks, Rosie Molinary, for guiding me there!) Low-residency programs function with the mentality that you should write where you live, not live where you write. It also allows for students (like me) to continue our day-to-day, 9-to-5 lives while getting our degree. It also means that our student body is incredibly diverse, from recent college grads to retirees. I go to a week-long residency at the campus in Vermont twice a year, at the beginning of each semester. During the residency, students have a number of different writing workshops to choose from every day, each one led by a talented faculty member. In between workshops, we meet with our faculty advisor to plan for the next semester. There are faculty and student readings every night, as well as lots of other events, and fellowship during meals, of course. By the time the week is up, I have crafted a semester plan that I submit to my advisor for approval. The plan is made up primarily of critical reading/writing and creative writing; in our third semester, we also do a teaching practicum, and find a place to teach writing in our community, to help prepare us for the teaching element of the MFA. I'm excited for that! The main crux of the MFA is our manuscript, our creative thesis, that we will complete by the end of the two-year program. In order to graduate, our manuscript will be read by two professors who will judge it to be "of publishable quality." We are encouraged to write what we want to write, what draws us in and compels us. Students write graphic novels, poetry collections, novels, hybrid forms, nonfiction, anything. I'm writing a memoir manuscript about my first years out of college. Our reading list for the semester - put together by our advisor - is meant to expand our outlook and enhance our creative work. Once the residency is over, the real work begins. Five packets of work are due during the semester, one every three weeks. Over the course of the term we work through our reading lists and write annotations for each book (short 2-3 page papers about a literary element of the book); I typically submitted three with each packet. We also have to write and submit creative writing towards our manuscript - my advisor requested 12 new pages per packet. We interact with our advisors by writing process letters, presenting our work and any questions we might have. Our advisors write letters back to us with thoughts, suggestions, ideas, and questions to make us think more deeply about our writing. The questions I have received are incredibly detailed, and address elements of my work that I don't think I'd have ever thought of on my own - so that in itself, I think, is reason alone to be in this program. 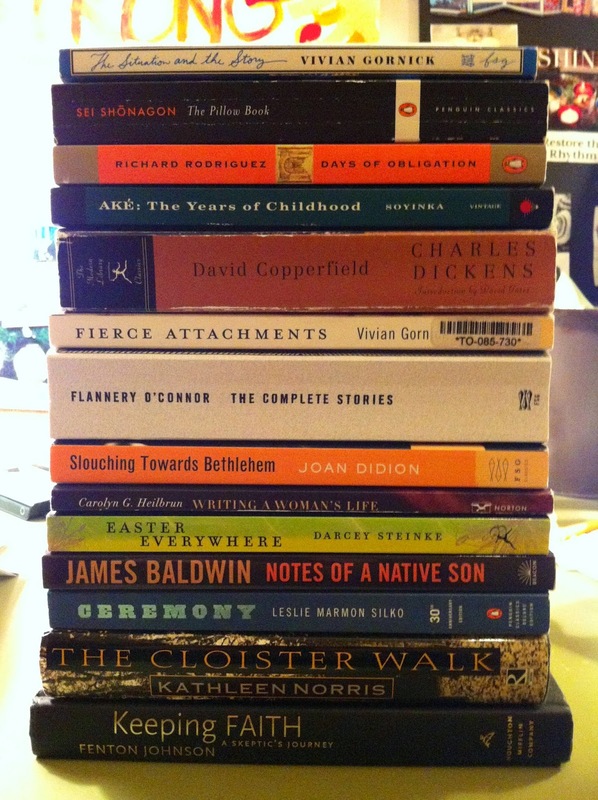 Reading that stack of 14 books was a challenge - well, that, and re-learning how to write critically. I was comfortable with that in high school and college but it's definitely been awhile. Slowly I got into a good rhythm, and really enjoyed all of the books. My favorites from this semester were The Pillow Book, David Copperfield, Flannery O'Connor: The Complete Stories, Notes of a Native Son, The Cloister Walk, and Keeping Faith: A Skeptic's Journey. It's funny; I write creatively a lot, but this felt like an entirely new venture. And in some ways, it was/is. This is a two-year project. That in itself is a timeline that's tough to grasp right now. The writing I do now might not make it into my final product at all, or it might make way for writing that is even more important. Since I'm so used to specific, quick deadlines for finishing a project, at work and in school settings before this, thinking longer-term takes some getting used to. Starting to write was definitely the most difficult part. I'm pulling material from real life, but where the heck do I start within that, even these last several years? I was overwhelmed. It wasn't until I began to free write about a very specific moment that carried a good deal of emotion, purpose, and specific detail that I felt like I'd finally found a starting point - for now. Who knows what will come next? What has intrigued me the most in this first semester is the concept of the narrator's role in a memoir manuscript. Yes, a memoir is based on real life; it is my story, and I am telling it. But which "me" is telling it? Is it a "me" in that moment, with no knowledge of what's coming next? Is it a "me" now, where I know a lot more, and does that feed into how I write the story? Is it a "me" with a mixture of that knowing and not-knowing, and how does that mold my telling of the story? Every author seems to tackle it differently, depending on what their story is and what they want to show the audience. That's the other thing I've started to learn: that depending on the purpose of the piece, the crafting of the book itself will be different. What am I trying to say to the world, and what stories from my life will best help me say it? Why is this important? I'm grateful that after four years of mulling it over, I finally got up the nerve to throw myself into this new place of learning and creative expansion. It's added an element to my life and my writing that I think will continue to impact me for years to come. And next up: summer residency, and semester two! Loved reading this, Claire. It is such a special experience and I love how you have approached it. Also, the summer in Vermont is incredible. I always went early just to soak up that gorgeousness. If there weren't five month of snow, I'd be a Vermonter for life. Do you think you'll work with the same advisor next semester? Look forward to hearing more! So proud of you, Claire! Totally nailed it! I love your reading list, too. Have you read Mary Karr and Alice Sebold? Augusten Burroughs? Some of my favorite memoir writers. Good luck with semester two!